You know regular soft drinks supposedly contain a lot of sugar. Most of the sugar takes the form of sucrose (table sugar) or fructose. You can read the side of a can or bottle and see how many grams there are, but do you have any sense of how much that is? How much sugar do you think is in a soft drink? Here's a simple science experiment to see how much sugar there is and ​​learn about density. It's an experiment, so use the scientific method. You already have background research into sodas. You know how they taste and may even have a sense of which tastes like it contains more sugar than another. So, make a prediction. How much sugar do you think is in a soft drink? 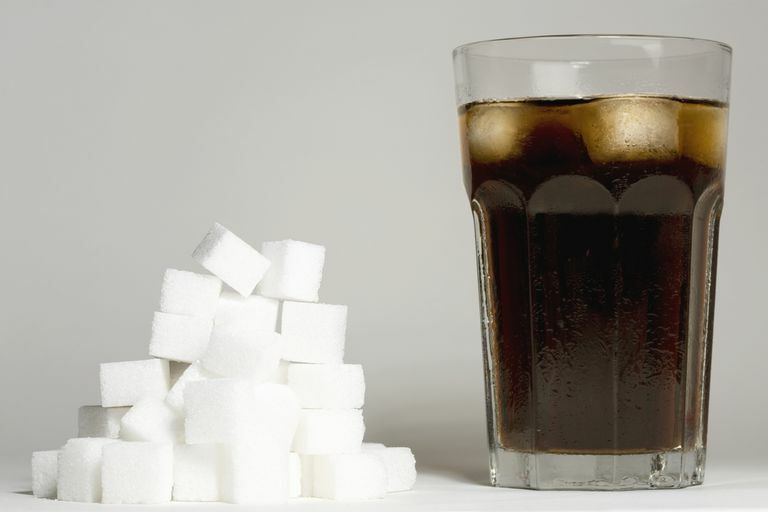 Do you think colas, citrus drinks, or other soft drinks contain the most sugar? Out of a group of soft drinks, which one do you think contains the most sugar? the least? Taste the soft drinks. Write down how sweet they taste, compared with each other. Ideally, you want flat (uncarbonated) soda, so you can either let the soda sit out on the counter or stir it up to force most of the bubbles out of solution. Read the label for each soda. It will give the mass of sugar, in grams, and the volume of the soda, in milliliters. Calculate the density of the soda but dividing the mass of sugar by the volume of soda. Record the values. Weigh six small beakers. Record the mass of each beaker. You will use the first 3 beakers to make pure sugar solutions and the other 3 beakers to test the sodas. If you are using a different number of soda samples, adjust the number of beakers accordingly. In one of the small beakers, add 5 ml (milliliters) of sugar. Add water to get 50 ml total volume. Stir to dissolve the sugar. Weigh the beaker with sugar and water. Subtract the weight of the beaker by itself. Record this measurement. It is the mass of the sugar and water. Record the density for this amount of sugar in water (grams per milliliter). Repeat steps 4-7 for 10 ml of sugar with water added to make 50 ml solution (about 40 ml) and again using 15 ml of sugar and water to make 50 ml (about 35 ml of water). Make a graph showing ​the density of the solution versus the amount of sugar. Label each of the remaining beakers with the name of the soda to be tested. Add 50 ml of flat soda to the labeled beaker. Weigh the beaker and subtract the dry weight from step 3 to get the mass of the soda. Calculate the density of each soda by dividing the mass of soda by the 50 ml volume. Use the graph you drew to figure out how much sugar is in each soda. The numbers you recorded were your data. The graph represents the results of your experiment. Compare the results in the graph with your predictions about which soft drink had the most sugar. Were you surprised? How many sodas do you drink in a day? How much sugar is that? In what way, if any, do you think the results would have been different if you had used a freshly opened soda, with lots of carbonation? Would the results have been different if you dissolved the sugar in the first three beakers in carbonated water rather than regular water? A sugar cube weighs about 4 grams. How many sugar cubes would it take, for each soda, to reach the mass of sugar stated on the container? Would You Use Sugar of Lead as a Sweetener?